DownNotifier is targeted for website owners, webmasters, marketers and any other users who rely on a website for doing business. Free website monitoring tool that sends alerts when your website is down. I use this to notify me when me and my clients websites are down. Pros: I currently use this in the free version, and set up and account for each of the clients with one dedicated email per account, which allows both me and the client to be notified when sites go down. The premium model seems pretty great, and a value for the money. Cons: I can't really say that I have a con about this service. I personally wish there was more of an agency bundle, which would allow you to have multiple sites under one account, monitor, but have billing paid out to the client. Overall: I'm able to know when sites go down and whether its indicative of the server or the website itself. Pros: The registration process for DownNotifier.com was simple and quick. It has the ability to monitor multiple websites. Your website is checked every minute. Cons: There was no insight given into the underlying error when your website goes down which was the only negative. 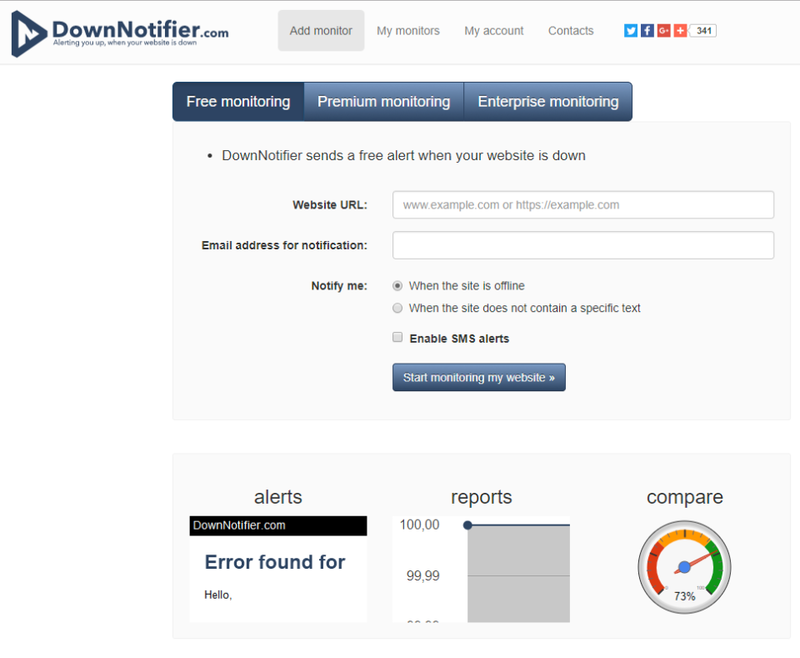 Overall: DownNotifier.com is the simplest and most efficient way to monitor the performance of our websites. It keeps the up-time of our websites up to date and provides security with checks every minute. DownNotifier.com is reliable and easy to use. It is easy to monitor many websites and URLs. We know immediately and directly if one of our websites has a problem. Pros: I use this across a group of websites that I maintain, it's my first line of defense against downtime. It's respoinsive emails are apparent in seconds, and I utilise them to maintain uptime figures in the 99.999% area. Without them, and this singular feature, I doubt that would be possible. At least not in terms of writing zero code and paying any money. Cons: I have no qualms. The software does what it says on the tin. End of story. Overall: I run multiple sites and I use DownNotifier on a few of them. I set alerts for sites that are prone to crashing from too much traffic. A lot of the times, you just need to restart the server, so this tool has definitely helped me increase uptime and avoid sending traffic to a crashed site. Pros: For people without large IT departments, DownNotifier provides monitoring and peace of mind so you know when your site is not functioning. Even when I'm traveling, I'm able to stay on top of site outages and resolve them. I don't know what I'd do without DownNotifier. Cons: There are no negative issues with this software. Overall: We've experienced increase uptime and higher customer satisfaction because we can address problems more quickly. DownNotifier keeps us running! Pros: It's instant - as soon as my site is down, I've gotten an email and a text message, anywhere in the world. When it's back up, I know that too. Cons: Nothing to dislike - as long as I know my site is down, I know I need to tend to it. Overall: Overall this has been a positive service. When/if my site goes down, and it can happen to anyone, I know instantly and can work to restore it. Every hour/minute of downtime is money down the drain, so having a jumpstart on any issues saves me a lot of money. Pros: The number one feature I enjoy about this is that we get notified via email the moment our site goes down. We can notify our development company before they even know there is a problem. Cons: There isn't anything we don't like about this amazing service. We'd like to take advantage of being notified via text message is possible. Overall: We get to find out when our site is down and not able to take orders. This is essential for our industry. Pros: It is fast, it is easy to set up a new monitoring. I did not see such simple UI in many other monitoring websites. Cons: You can not set up time between checks, and sometimes because of that - in website logs you see hundreds of checks in a row between real usage. Overall: We as a company have a lot of websites, and some clients are very crucial. With help of downnotifier we can react very fast if something bad happened and websites is / are down. Pros: I have a server in a data center. I cant watch them all the time, so being able to receive email and text notifications instantly when the data center is having a problem and my server cant be seen is critical. This is an affordable solution that has worked every time! Cons: No complaints at all. Everything has been working great. Overall: A few times my data center has had ISP outages and i knew instantly. Times when i have rebooted my server, i got a down notification which makes me feel good that if its down for an unknown reason, i will know right away. Pros: We had some issues with the power supply of a server, resulting in intermittent shutdowns. DownNotifier allowed us to map the downtime which greatly helped with keeping track of the problem and deciding whether the problem was structural. Pros: It's nice being able to know right away when my site goes down without having to pay anything. I can respond to issues quickly, often before anyone notices. Cons: I wish it included HTTP response codes in the downtime notification subject lines so I could more quickly see what type of problem was occurring. Pros: I like the instant warning and notification that my site is down, which helps me trouble shoot issues and figure out if I need to contact my body, as well as keep track of how reliable they are. We now have an update for brief downtimes. You can now set alert limits to set a minimum downtime before you get an alert (https://www.downnotifier.com/list/account/alert-limit). You need a premium account for this feature. Because you was the first one on this site to help us to design this feature, we would like to offer you a premium account for free. Please send us an e-mail with your account login to arrange that. Pros: Easy to tune and link to my website. I could see that this is something which could work without installing tons of codes onto my website. Cons: Nothing. That's what you want from a service like this. No frills or behind the scene advertisement. Pros: To get the best of the website, you need to get the premium package. But it is easy to use, and when your website is down it tells you the cause. It records the history of your uptime and downtime throughout the year. You can also change the time interval on how many requests you want Downnotifier to ping your website. From every 20 seconds to an hour. Personally, every 20 secs is a bit extreme so I'm using 10 minutes per ping. An e-mail is sent your mailbox whenever your website is down. You can add multiple e-mail accounts on where you want them to send it to. You can even receive SMS alerts! Personally I never use it, but it's nice to have. Cons: It's missing something like a Public Status Page. If the website is down, I want customers to know the status on what's happening and we are aware. Or for them to check if the website is really down or it's just them. Pros: It's free and keeps me up-to-date about the uptime of my servers and about the servers of my customers. I use down notifier as a fail safe for my other uptime checker. Cons: Free version doesn't give you al the details of the uptime of your server/website. Would like to see a graph added to it so i can check the number of times it went down and for how long. Pros: I am using the free plan and so far downnotifier.com isn't a let down. Simple to setup and I get notified when something breaks. All that I can ask for at this point. Cons: I guess what I enjoy least about downnotifier is the pretty bare-bones design, which is does the job but does not accentuate the important information enough. Pros: Quick and easy to setup. Very reliable. Alerts instantly when a public facing url goes down. Cons: There aren't any cons I can think of. The free options are great as well. I use the free product. It notified me immediately when an Apache upgrade went awry. Pros: It is easy to use and works well. The checking frequency is fast, I think my site was down for around a minute before being alerted. Cons: It would be have more alerting options. I happened to be on my email when my site went down, but hooking into PagerDuty would be nice. Cons: The error which are given by this down notifire is not proper. Pros: I love that I am always in the know when my site goes down and for how long. It allows me to make better decisions on weather or not to stay or switch hosts. Pros: It has never failed to alert me. It is accurate up to one minute for the free tier. Cons: You have to renew the free tier yearly, but it doesn't bother me that much. Overall: Great. Monitoring for my blog couldn't be any easier. Pros: I love the fact that they do exactly what they advert. I use their service to monitor my websites downtime and to alert me in case of any problems. I always got their alters and I always managed to resolve problems without affecting my clients experiences on my platforms. Cons: Maybe they should offer additional services. Cons: Sometimes there's a delay of up to 1 day to hear your site is back up, but that's probably more a limitation of DNS propagation or something. Overall: I rely on downnotifier entirely whenever I make changes to a test server configuration. I make a change and then wait to see if any sites go down, then I know if I've done something wrong. Pros: DownNotifier.com is great because it easily lets me know as soon as one of my websites is offline or unavailable. It also lets me know when the come back online. I highly recommend anyone who manages a website to use this service!! Cons: DownNotifier.com does everything I want it to do, and it does it well. No cons. Pros: If you are experiencing any trouble with your website or server, this is a MUST! Even if you don't have trouble now, get alerts if your site goes down in the future! Cons: No issues at all! Easy to use, setup, and manage! Overall: Again, I wouldn't go without it ever again. Great service! A very simple and easy system, which gives a very positive experience. Pros: Fast responses, ease of use, multiple website monitors, free features that do not force spending, premium features that I would consider using. Cons: There is not always a reason provided when a website is down, which may not be impossible but some sort of message would be welcome. Pros: It's easy to use and it does exactly what it's intended to do. Cons: For some people the 10-minute-scan-interval that comes with the free version might not be enough. But the upgrade to Premium is really cheap so this does not really matter. Pros: The thing I appreciate most about DownNotifier is that it only takes a few minutes to set up and then for the most part you can forget about it because it'll continue to run as you intended until you decide to make changes. Cons: On occasion I notice that the notifications run on a few minutes delay. Pros: I like knowing that I will get a notification if my site is ever down. Cons: I wish it was possible to get some more in-depth information about why the site is down. Pros: Easy to sign up. Prompt notifications - often faster than internal notifications. Very reliable as well. No false positives. Cons: I really have nothing bad to say. Works as intended. Overall: I have a server in another state, if it's down our client's clients start making big complaints. Having your email configured to receive status information is beyond useful. Pros: It took almost no action on my part. I just provided a domain and it lets me know if there are issues. Cons: My host was dropping my service almost daily for ~5-10 minutes at a time. My email was flooded with emails from Downnotifier. But that's my host's fault really and now I have a new one because of it. Overall: Simple up-time tracking of my website. Pros: I was looking for a web tool to tell me when my site when down. DownNotifier.com is a web tool which tells me when my site is down. We're a match made in heaven. Cons: That they didn't make themselves known to me sooner. Pros: The free version is extremely fast and just works. Email reporting is awesome and works like a charm. Cons: There are sometimes issues with accounts and adding or verifying sites. Apart from that it's a really good service. Overall: I get to know when my sites are down and within seconds I can be on fixing them. About your feedback about adding or verifying sites: we improved this in the last couple of month. Pros: It is very responsive. As and when the site is down we get the notifications. We are able to keep the site up all the times. Cons: I don't have any right now. It is good if we have a mobile app for better notifications. Pros: Does what it's supposed to do and tells me when my client's werbsite goes down. However, we changed from www to non-www, and added SSL to the website and it had an alert when I logged in asking me if I wanted to update the URL. Good touch! Cons: The login. If you go to My Monitors > It says "Please enter your email address to login or register." I had entered my email address, then it asks for a password. It doesn't let you know that the password is only for people who have accounts as it appeared to me I was setting up a new account. It said my password was incorrect. So, do I didn't know if I had an account with that email or not. It should have given me more info. Pros: Easy to use and it what it is promising. Pros: It's free and simple to use. That's about it. Cons: Main issue is you can't restrict tests to specific regions. With various motivations for blocking the EU, I get outrage notifications when tests originate there. It doesn't even tell you the location of the test when a problem is found. It also should give more information on the problem. Sometimes it reports an error and sometimes it doesn't. I run multiple down notifiers and this one seems to have a lot of false positives. Pros: I like how it monitors my site 24/7. Being a business owner, I am extremely busy and find that I need to automate many of my tasks, such as checking my domains. I love that downnotifier keeps an eye on my domain for me. Cons: It would be helpful if the email notification that tells me my site is down gave more information. Pros: I found about Downnotifier.com when i needed a monitoring website for my vps, after that day its my good to go friend. Cons: UI looks bit of outdated, needs refresh. Pros: I love that I can walk away from work knowing I'll be notified at any time if the site goes down. Cons: I wish it was a little more accurate in the time that the site was down, but that's pretty minor. Pros: Notifies when site is down that is pretty much it. Cons: Sometimes incorrect and that is pretty much it. Pros: Love how easy it is to have your site monitored for downtime. Cons: Not many options on free version. But I get what I expect for being free. One of the best tools to monitor website down time. Pros: The ability to monitor multiple sites we have as an agency. Cons: It would have been great if the software had some insights about what went wrong whenever any websites go down. Overall: Real time notifications about the websites down time. Based on the notifications, we could make certain decisions about our hosting service provider. Pros: Email notifications when a website was down. Cons: If the website was down for a nano second I would receive an email notification which started to become annoying.